Ever wonder why the world is so insane ? 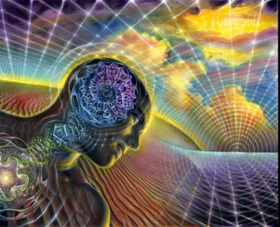 Well consider this , each human being is a separate state of “being”, each of us have a unique perspective, and so in that sense , we are each a completely unique and separate parallel universe. So no wonder the world is crazy , we have 7 billion parallel realities in a constant state of flux, interacting with each other, and in many cases some trying to control the outcome of others…it’s a free for all , welcome to the show ! You see … consciousness has these reality agreements set up , as collectives and as individuals, of course from a greater persepctive there really is only one consciousness , one being , but that was kind of boring so we fractured the one …into the many, and that’s when things got really interesting. So here we are , the human race, a collective of 7 billion perspectives , the great experiment , where 7 billion realities (known as human beings collide into one massive mind created experience , and here is the kicker , because each of us are a separate reality every other being we experience, whether it s a family member , spouse, friend or someone on the street, they are really just a version that we create of them. I know it’s crazy and rather difficult to conceptualize from a linear , polarized , single reality based perspective, however as you move towards a more unified state of being, or unity consciousness , as you begin to remain fixed in present moment awareness , you begin to get insights into how we are each at the center of our own personal universe. So when dealing with the so called other people around you , remember you experience “them” through your own filters , beliefs and definitions , the person you experience as your spouse or friend changes as you change , they are not a static or fixed any more than you are! I know , I know what your thinking , the old saying “people never change” , well if that appears to be the case in your reality , your universe , it’s probably becasue your not changing, I assure you they will change when you change , remember in the end , universe is simply a mirror , nothing more , nothing less. So how does this information help you in your day to day experiences, well it can help you tremendously if you use it in a positive way. Knowing that “what” you are experiencing , including other so called people , is a direct “Reflection” of your state of being ( emotions, thoughts, beliefs, definitions ) allows you to change your reality to that which you prefer while at the same time allowing others to do the same without trying to manipulate their experience , or their reality. You follow your joy , love unconditionally , with no expectations , and universe will support you , and by universe we mean those around you , they will become a better reflection of unconditional love , passion and joy. So how do you know, that what you are choosing to experience, in your reality, is not manipulative, or otherwise causing harm to others or altering their reality in negative way … one word …suffering, if your causing others to suffer( and ultimately yourself ) then you can be sure that what your choosing to experience is not in alignment with your true self, your core vibration , the presence that you are. Of course universe supports everything and , so yes there are those that enjoy harming people and inflicting suffering and pain on others , but only becasue they experiencing pain and suffering internally , hence the reality they create, so obviously the people around them will reflect pain and suffering. So again…the only way to change the world or more accurately the reality you experience , is to be that change , as Gandhi , Jesus , Buddha, Krishna and every other enlightened being have always said ! What they are saying is , be the reality you wish to perceive , there is “No” other way to experience any change otherwise in your personal universe. You can never perceive that which you are not the vibration of !